In the wake of the Istanbul terror attack, we must mend our country’s bitter divisions. Istanbul— “Be calm now…something happened in Istanbul tonight…” said my husband, Mustafa, while approaching me with an iPad in his hand, hesitantly announcing news of the latest horrific terrorist attack on June 28. The reluctance in his voice rightly signaled worry about my reaction, as I started wailing for the dead and for Turkey’s fate. We immediately tuned to local news channels to learn the details. As the night unfolded and the number of victims grew, we stood in front of the screen bewildered and in awe. The final numbers show a distressing number of casualties: 45 dead and more than 230 wounded. Although no one claimed responsibility, the “softness” of the target, the style of the plan’s execution, and the suicide vests used—by three bombers, two of whom were identified as Russian nationals—all pointed to ISIS. The attackers’ insidious plan unfortunately worked, but only partly, thanks to courageous police officer Yüksel D., who shot at one of the three suicide bombers before he blew himself up, thus preventing a much larger number of victims. Also heroic was customs officer Umut Sakaroğlu, who tried to stop the second terrorist and died in the explosion he set off. 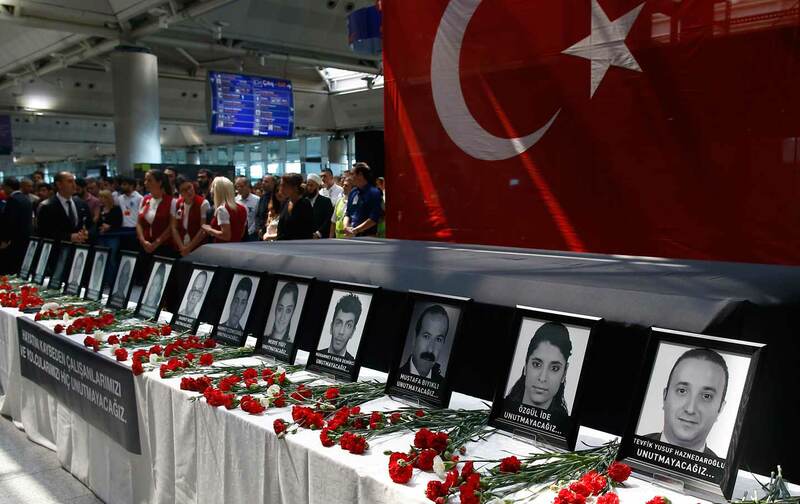 The next morning, flights at Ataturk airport—swiftly cleaned up after the carnage—continued as normally as possible. The government pushed hard to present to the outside world an image of Turkey unharmed, even as officials announced a day of mourning while messages of solidarity poured in. Yet the growing frequency of terrorist attacks has understandably alarmed Turks. Recent developments have been difficult enough, quite apart from those attacks: decaying democracy; the rise of authoritarianism; lack of press freedom; corrosion of the judicial system in terms of judicial independence, the separation of powers, and the rule of law; increasing violence against women; proliferation of conspiracy theories.… On good days and bad, I’ve always loved this country, but sadly, today’s Turkey is not the same place I moved to five years ago. My story, of course, began much earlier. As Bosniaks—that is, South Slavic Muslims inhabiting the Balkans—my family and I left Kosovo’s capital, Pristina, for Sarajevo in 1999, when NATO started its aerial intervention against Yugoslav forces. The war in Kosovo was not ours to fight, and we did not want to die as collateral damage in that Serbo-Albanian conflict. Bosnia and Herzegovina has always been our emotive homeland, so we sought refuge there. In the late 19th century, my Muslim ancestors from the Sandzak region were often forced to migrate, following the withdrawing Ottoman army, due to attacks by Serb and Montenegrin—that is, Christian—forces. My great-grandfathers loved Turkey, the inheritor of the Ottoman Empire. And though I did not visit Turkey until I grew up, my appreciation and respect for the country was ingrained in us from early childhood. Twenty-something years later, after spending several years of study in the United States and France, I moved to Turkey to get a PhD in international relations. This was part of an excellent government initiative to attract foreigners and increase the diversity of the student body. Unexpectedly, I found the love of my life in Istanbul, and now we have a 15-month-old son, half-Turk, half-Bosniak. As both an outsider and an insider, I have been able to witness first-hand the recent ups and downs in this beautiful country that I now call my home. Turkey was the shining star of the Muslim world, with commendable government policies that celebrated diversity. In 2011, when I settled here, Turkey was the “it country” of the region, widely cited as proof that a synthesis of Islam and democracy is possible. It was the shining star of the Muslim world and a poster country in the West. The economy was booming; the policy of then–Foreign Minister Ahmet Davutoğlu, “zero problems with our neighbors,” was working like a charm; and the honeymoon with the European Union was still on. Maybe most important, there were commendable government initiatives for a “Kurdish opening” to peacefully solve the ethnic tensions that had plagued the country for decades. These and other policies signaled a more open, liberal Turkey that celebrates rather than suppresses diversity. But as the ruling AKP party became stronger and its spirit more vengeful, the already existing fissures in society widened. Instead of building bridges between religious conservatives—whose freedoms had been suppressed by the previous illiberal secularist regime—and secular parts of society, it seemed like the roles were simply reversed. The now famous Gezi Park protests of May and June 2013 marked the government turn toward authoritarianism. I could sense the bitterness from the acrid smell of tear gas the police sprayed too generously, reaching even inside our apartment. Then the AKP came under more domestic political pressure due to major corruption allegations against four of its ministers. Soon, the ruling party’s tacit alliance with the Gulen movement—a powerful Islamic community that was once its ally—went down in flames, leading to a rift within the conservative camp, adding to other hatreds. At the time, it felt like Turkey was accelerating toward dystopia, rather than Muslim utopia, overnight. The tragedies in Turkey’s neighborhood contributed to the rising internal tensions. When refugees from Syria started pouring in by the hundreds of thousands, Turkey responded in a gracious, praiseworthy manner. Yet the war in Syria got only worse, and Ankara’s eagerness to topple the Assad regime blinded it to the other evil emerging from the chaos—ISIS. For sure, the responsibility lay mostly in the mass-murdering Assad dictatorship in Syria, as well as the broader turmoil in the Middle East. But Ankara made everything worse for itself by thinking that it had the wisdom to fully understand, and the power to radically transform, the whole region. Terrorism, either by ISIS or the Kurdish PKK, is partly a bitter fruit of that delusion of grandeur, in addition to the zeal of the terrorists themselves. As a result, some 298 people have died in attacks in Turkey over the past year. How can one become used to the killing of friends, family, and fellow compatriots? Turks are now often channeling their anger in the wrong direction. Hence the brazen reactions by politicians from both the ruling party and the opposition, including accusations of blame, either for causing or not preventing the latest attack. This reflects overwhelming polarization in Turkey, which is symptomatic of the country’s communitarian culture, one that dictates respect and protection only for the in crowd. There is generally zero support or tolerance for those outside one’s group of similar-minded friends and family. So continues a longstanding tradition of “othering” in Turkey. The government’s strategy in response to the airport attack seems to be to showcase a speedy recovery while at the same time drawing sharp party lines, thus depriving people of the possibility of sharing their pain. We read heartbreaking stories of the victims of the attack, while at the same time we pretend that life goes on as normal, preparing for Eid celebration or summer vacation. I’ve witnessed enough post-traumatic stress disorder after wars in the Balkans to recognize some patterns. The absence of opportunities for collective grieving and healing poses an all-too-familiar threat to social cohesion. The ruling elite needs to stop its intoxication with power and push for internal reconciliation. Since regional crises will continue to hobble Turkey, the ruling elite needs to stop its intoxication with power and push for internal reconciliation between secularists and Islamists, Sunnis and Alevis, Turks and Kurds. The government has the largest responsibility in curing this malaise, but others must contribute, since all parties are responsible for Turkey’s bitter polarization. I have seen too much strife to allow the latest events to dampen my belief in Turkey’s potential. Turks are strong people. If we can learn to experience the benefits of self-criticism and master the art of compromise, we can rebound stronger than ever. This is my son’s homeland, so parental instinct encourages me not to give up hope. Riada Ašimović AkyolRiada Ašimović Akyol, a PhD candidate in international relations at Galatasaray University in Istanbul, writes for Al-Monitor, Al Jazeera English, and Avaz daily.